The UI in Starcraft II is a beautiful display. Like everything else (except the ladder), it's so refined that its excellence barely registers. It's not subtle: big blocky forms house unit data, an animated portrait, and the minimap on the lower quarter of the screen, while a bar at the top shows a standard RTS info ticker (resources, supply cap, etc.) 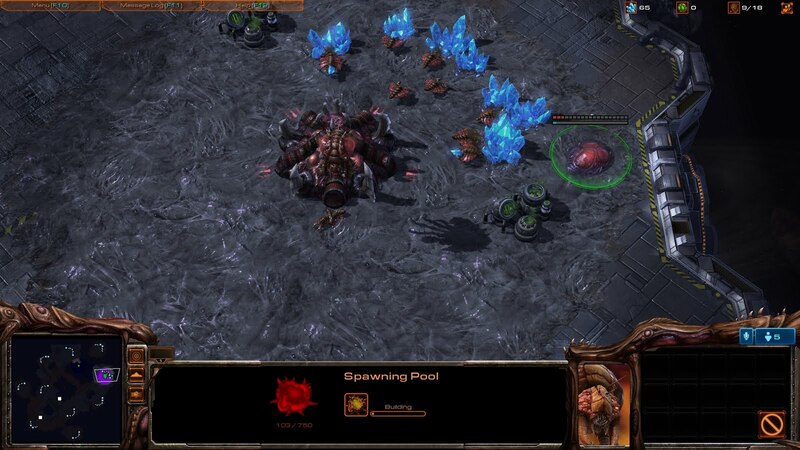 It retains the look of the original Starcraft UI, but decorates it with race-specific touches. If the image to the left was an animated .gif, you could see the Zerg tentacles gripping the HUD undulate. Unlike some other cumbersome Blizzard UIs (Diablo comes to mind), the SC interface has a legitimate claim to all that screen real estate. 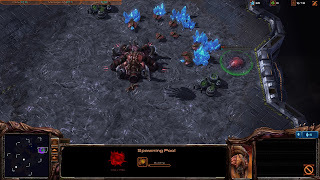 More than anything, Starcraft is a game about managing a huge volume of information: directing units on the battlefield while continuing to spend resources, noticing when buildings and research back in your base are completed, scouting for enemy expansions on the minimap, and keeping tabs on innumerable micro and macro concerns. But the UI couldn't be large enough (and if it were, your eyes couldn't watch enough of it) to tell you everything you want to know. The SC UI doesn't try to make you watch all this information; often, it lets you hear it. I don't want to talk about the short, funny lines units say when selected, or the separate musical themes for each race. These add a lot of flavor to the game, but they've already been pored over elsewhere. I'm more interested in function than ornamentation: SCII's audio is fascinating because it can play a huge role in the actual strategy and flow of the game. There are a few odd sounds that become familiar to every player. The Zerg Changeling impersonates one of your units, assuming a friendly form (say, a Zealot) and not appearing hostile until clicked; however, the sound of an Overseer dropping a Changeling in sight of your buildings is distinctive, and as soon as you hear it you begin hunting for strange Zealots. If the UI displayed a visual alert that your enemy had made a Changeling, the unit would be nearly useless. Blizzard gives players an audio cue instead, playing an unusual noise that can either pass without notice or be a dead giveaway. A few sounds will never pass without notice: the Nydus worm (a Zerg unit that can ferry an army from his base straight into yours) roars as it breaks through the earth, leaving any unprepared player scrambling to get a visual of it. A friend of mine called the telltale sound of Terran tanks going into Siege mode a "fight-or-flight" signal, and the game has a number of little cues like it. A visual reminder that "enemy tanks have entered siege mode!" would be overkill, but knowing that they have just sieged is essential data. More than any other RTS I've played, SCII tries to create a second channel of communication to the player through a varied set of audio signals. It's expected that an RTS game will provide audio cues for building completion and combat, but even these seem to have heightened importance in SCII. I'm always listening for that strange whispery rushing sound played whenever a Protoss building finishes warping in. In a game where build order is vital, I really think this sound helps me find a rhythm early in the game, and keep track of the tech in my base while I'm moving an army around the map. Although your eyes might be jumping back to the resource ticker, the audio also becomes an essential part of your planning and pacing. I know one solid audio trick, but I'm sure better SCII players have many more. On the map Blistering Sands, the player's base can be reached either through the standard frontal chokepoint or a "back door" entrance covered by destructible rocks, which units must attack for some time to break. It's often a good idea to go through the rocks early in the game, bypassing the other player's army and attacking his workers directly. To guard against this, players can leave a cheap building -- a pylon or supply depot -- on the inside of their base to watch the rocks. From my perspective: a pylon placed between the tall grass serves as an early warning system. The image above is from a ladder game where I took this basic step. The pylon does give visibility of the rocks, but an indifferent minimap watcher like myself might miss seeing units even when they did appear. The pylon's real value is letting me hear enemy units attacking the rocks, even when I'm not looking at them. In SCII, you can hear sounds from revealed areas on the map even if those areas are offscreen. That feature actually won this game for me. In the image above, two enemy units are attacking the rocks. It's almost impossible to see them in a screenshot, as they were stealthed. But I could hear them just fine; their attacks are as loud as those of any visible unit. The replay's omniscient perspective reveals the enemy Protoss player's stealthed Dark Templars, hidden in the previous screenshot. 1. The other player was trying to attack my base by going through the rocks. 2. The other player was producing Dark Templars, which are extremely vulnerable to an army accompanied by an Observer, which reveals invisible units. All of this was communicated simply from the sound of the DTs' attacks and the fact that I couldn't see them. From there the game was easily won, as my army and an Observer chased down the DTs, then stormed the enemy base. It still amazes me that this game (admittedly, a game between two low-ranked players) hinged on that single eavesdropping pylon. The match remains one of the most memorable experiences I've had in SCII. If anyone else in the beta has thoughts about the game's sound design, I'd love to hear it in the comments. The sound effects described above are just a brief list; I'm sure there's a lot of significant audio I failed to notice. Email me about this post at post.hype@gmail.com. I'm also in the SC2 Beta, and I wouldn't dare playing without my headphones on. You're very correct in that listening alone does a lot to keep a player in check of his own pacing. I often forget I've built a Spire, as it takes almost 2 minutes to complete and happens in the mid-game when I'm concerned about keeping my multiple bases safe - that is, until I learned to listen for that echoing call of Mutalisks that plays once the Spire is up. And let's not forget the Nuclear Launch signal. No player would ever look for that red dot if they didn't hear it first. Interestingly, when a Terran player builds a nuke, all their teammates will hear the sound cue (like a giant missile being loaded). So I'm pretty sure if you have vision of an enemy's Ghost Academy, you'll be able to hear when they build a nuke too.